Description: This is a beautiful pen with a clip shaped like the Aids ribbon. Th Aids Ribbon Pen has a confortable rubber grip and a white barrel. 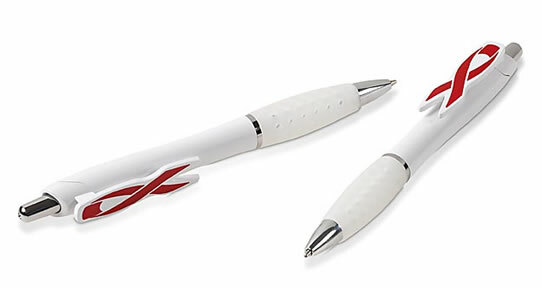 This Aids day pen can be branded with your company logo. The Topsy Foundation will receive R0.50 from the sale of each of these pens. These pens are unique and a great way to support a good cause. A branded pen is a useful gift that clients can use on a daily basis. We are a premier supplier of branded pens in Africa. For more great options, please go to our Logo Pens website.